LA PAZ, Bolivia, April 20, 2011 (ENS) – Bolivia today marked the International Day of Mother Earth with a ceremony in the Plaza Murillo, the center of political power. An ancient ritual shared center stage with speeches in which authorities in this Andean nation extolled the Law of Mother Earth – the world’s first legislation that grants to all nature rights equal to humans. 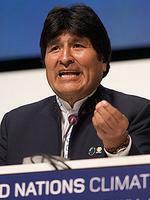 President Evo Morales, the first indigenous leader of Bolivia, is the architect of the Law of Mother Earth. Supported by politicians as well as nongovernmental organizations, the law is expected to easily pass the National Congress where Morales’ ruling party, the Movement Towards Socialism, has a majority in both houses. Today’s event was attended by representatives of the executive branch and legislators, diplomats, indigenous peoples and peasants. 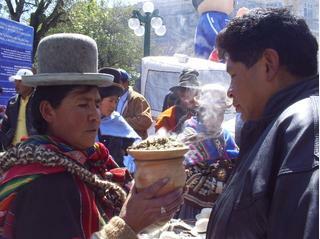 In parallel, a fair was held to raise awareness about global warming and its effects, and the Bolivia-led crusade for nature protection. Minister of the Presidency Oscar Coca told the crowd that Bolivia has the “conviction” to promote international policies that promote awareness of the climate change problem in all nations across the planet. “President Evo Morales says the planet can live without humans, but humans can not live without the planet and reminds the world today that the rights of nature should be rights equal to those we, ourselves, enjoy,” Coca said. The law promotes “harmony” and “peace” and “the elimination of all nuclear, chemical, biological” weapons. At the same time, President Morales is set to announce on May 1 that he will be “dismantling the privatization model,” thereby expropriating privately owned zinc, silver and tin mines. The government plans to place these mines under government control reversing the actions of previous administrations that sold the mines to private interests. The Corp Minera de Bolivia, known as Comibol, will operate all the newly expropriated mines. Several mines have already been expropriated under Morales presidency, including the Vinto tin smelter. Soon after his election as president in 2006, the Morales Government took over gas and oil refineries, all in a bid to have the government control the country’s natural resources. As a result of these policies, foreign private investment in Bolivia has plummeted.